Playdates are a corner stone to building children’s self-confidence and independence. Play dates at friends’ houses provide a chance for a child to strengthen their social muscles in a safe setting. But for parents with children that have allergies or those who are thinking of hosting a child with allergies, this can present some challenges that are best addressed before little friends arrive. These tips will ensure that the playdates are fun and that the only worry is having enough blue play dough for everyone! Kids that have dangerous (anaphylactic) reactions when they eat certain foods, travel with an epinephrine injector (EpiPen) and their parents. However, when mom and dad are ready to let them try a playdate on their own, make those first few independent playdates short and build up everyone’s ease with getting together. When everyone is ready for a longer visit, be sure the following steps are taken. Talk to your allergic child. Don’t scare them, but remind them what happens when they eat their allergy food and what they need to do to avoid “feeling yucky.” Chances are they will remember the reaction they had even if it happened when they were really young. If your child is the one with a severe food allergy and your doctor has prescribed an EpiPen, make sure it is with your child. If your child is old enough, teach them how to use the EpiPen and practice with them. In addition, if you are the parent of an allergic child, talk to the host. Out of courtesy and caution, let your host know what your child’s allergy is, what you do to avoid it, what the signs of a reaction are and what to do if symptoms start. Provide a picnic for two. Take the stress off your host and send along a bag of safe foods to share, including drinks and any needed plastic ware. Picnics are always fun indoors or out! There is less worry about playdates that include sharing a meal when children have mild food allergies or intolerances. Symptoms can be uncomfortable but not life-threatening. Still, talk with your child and their host about the allergy, how to avoid problems and what to do if symptoms occur. 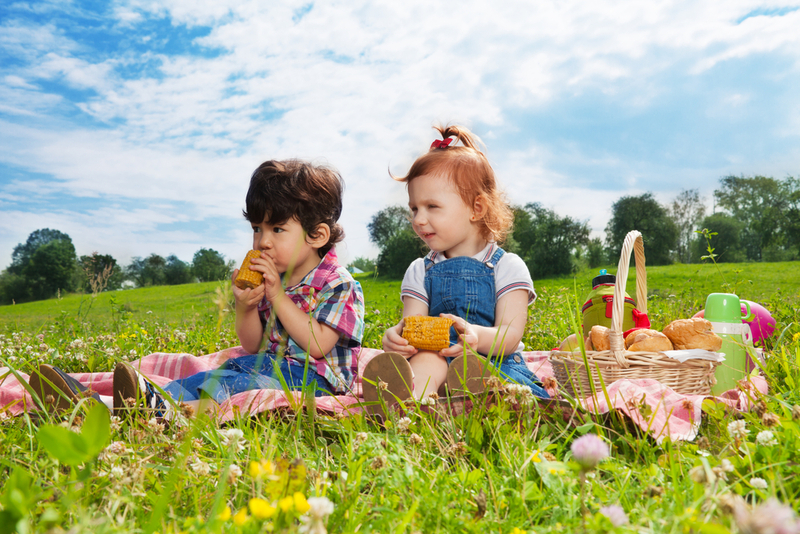 Providing a picnic can make these playdates easier as well. Alternatively, you can also provide a list with the ingredients your child can and cannot eat. Regardless of what type of allergy your child’s friend has, talk with the child’s parents to make sure you are aware of food restrictions and what, if anything, you should have in the house. Let your own child know if their friend has allergies and what symptoms look like. If you are preparing food for the child with allergies, make sure you eliminate cross-contamination by washing cutting and eating surfaces with hot water and soap. Prepare only those foods the parent has said are safe and let the parent know at pick-up what the child ate. Most of all, relax and enjoy the social opportunity you are providing both children! For more information about allergies consult: http://www.mayoclinic.org/diseasesconditions/food-allergy/basics/definition/CON-20019293 or your local children’s hospital. Food Allergies in the Classroom – What’s for Lunch?